Vivamune chews contain the OxC-Beta™ Complex, specially formulated to support your dog’s immune function. Powered by the OxC-Beta™ Complex, Vivamune packs triple the health punch in one daily dose. Specifically formulated to support the foundation of vital health, the immune system, Vivamune maintains healthy joints, skin and digestion. Promotes healthy skin and soothes skin-related issues associated with seasonal allergies. Supporting the joints of an active pet is crucial. The OxC-beta™ active ingredient is complementary to glucosamine, and may help animals maintain healthy hip and joint function throughout their lives. The digestion system is the first line of defense against foreign pathogens and is vitally important in maintaining vibrant health. By supporting the immune system, Vivamune promotes healthy intestinal function. Vivamune for Dogs of All Sizes contains 10mg of the OxC-beta™ compound in each soft chew. A tasty chicken flavor was palate-tested and heartily approved by our panel of discerning dogs. Manufactured in the USA with imported and domestic ingredients. arabic gum, brewers yeast, calcium sulfate, canola oil, citric acid, citrus pectin, glycerin, maltodextrin, mixed tocopherols, natural imitation chicken flavor, oat flour, oat meal, rye flour, propionic acid, rosemary extract, silicon dioxide, sodium alginate, sorbic acid, soy lecithin, vegetable oil, water. I’m thrilled to finally have a solid supplement for poor Cooper. Out of everyone, he probably needs it the most, so it’s a relief to find one that doesn’t contribute to his allergies and seems to alleviate some of his symptoms! Its amazing portability and no side effects (for us) assures that Hunter will always be receiving the proper support and aids she needs. Especially at Hunter’s age (14), her joint issues constantly slows her down— these chews have relieved her joints of discomfort and we couldn’t be happier! So far, this is my favorite ‘all-around’ supplement. Most supplements are specific for joints, skin, or digestion, but the Vivamune chews help with all of them. The beta-carotene blend is unique and something I haven’t seen in a product before. My friend, and veterinary technician, Danielle tried the large dog health chews for her dog Retta and the cat health chews for her cat Drake. She reported back that both Retta and Drake’s digestive systems looked great and they both loved the taste. Additionally, she noticed positive changes in Retta’s skin/coat health. Neeko did her first true play bow/downward dog after being on the Vivamune for two weeks. Vivamune is indicated for joint health, but I was not expecting to see this. I nearly jumped for joy, as the princess has never done this before, I assume because of the discomfort in her hips. She also seemed to run a bit harder and faster, and needed less recovery time. I am truly very impressed with this product. The chews must be palatable, because picky Faolan took his each day with zero problem or hesitation, which is a bonus. As a pet parent, I believe in giving supplements. 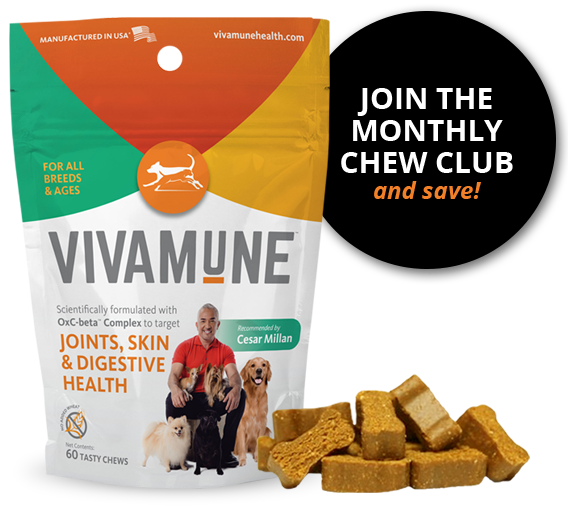 Vivamune chews contribute to Sugar’s playfulness, stable mobility and glorious shinny coat. It has a mild scent which makes Sugar eager to have it. For Sugar, Vivamune is a tasty treat, 4 Golden Paws Up! We were super excited to try these out and I am happy we did! With extra large dogs (Great Pyrenees) I’m always really worried about their joints and if they are getting enough nutrition from their food- these support their immune function, hip and joint function, and healthy digestion! They seem to thoroughly enjoy the chicken flavor and I don’t have to hide them in food for them to eat them. I also really like the size; we can give them to our smaller dog without any size issues. Our oldest Pyr cane with several skin issues due to diet and I’m confident we won’t have a repeat issue with these helping. I love that they love them but I also love that I feel like I’m fully supporting them as they grow. Gypsy, my 1 year old mystery mutt has skin and digestive issues. Most the vets I went to said there’s not much to do besides providing proper nutrients in her diet. And these vitamins have provided that! She no longer has issues with her meals, she’s gained weight and has a normal function when she goes number two! And her skin has never looked better, even during allergy season!! Not only have I seen improvement in her overall appearance, she’s also became more energetic and just seems happy! I give that credit to Vivamune!! I bought this for my 8 year old rescue dog. She was getting touchy with her hips, started getting allergy’s bad enough that her eyes were so red & swollen. Her digestive system was out of wack and she would throw up after eating her dinner. After a few days, with a Benadryl, she was acting like she was 2yrs old again. My daughter has ab older dog she rescued, he is having hip issues, this is helping. He gets around better! Soooooo, my Brother-In-Law has a small dog, 15lbs or so, that is eating well, but now is pretty much dragging her back legs behind her. I sent some Vivamune’s over and after 1 week she is more spunky, and is able to have better control over her back legs. I am so amazed. This product is not a scam. It truly helps our furry babies live better lives. We’re so confident your pet will see the benefits of our product that we offer a 60-day money-back guarantee. While Vivamune is beneficial to dogs of all breeds and ages, it is particularly recommended for older dogs to support a healthy immune system. Subscribe to our Monthly Chew Club: receive monthly or bi-monthly shipments automatically and save 15%! When our dogs are healthy on the inside it shows on the outside. From healthy skin to a spring in his step, your dog will let you know when he’s feeling his best. Vivamune chews support the immune system which creates the environment that allows the rest of the body to be vibrant and healthy. A truly holistic supplement which works with your dog’s body to help them help themselves.